The Philadelphia Folk Festival returns to the Old Pool Farm in Upper Salford Township near Schwenksville, PA this weekend for its 54th year. The longest continuously running outdoor music festival of its kind in North America is a unique combination of music, showcases, workshops, crafts, children's activities, camaraderie, and community. 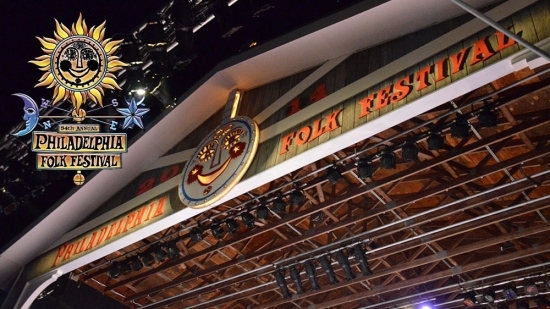 The Folk Festival features both traditional and contemporary folk music on a variety of stages during the day and on the Main Stage each afternoon/evening. In addition to the rest of the lineup, over 40 Philadelphia-area acts will take the stage at this year's fest. Some notable headliners include: Lyle Lovett and his Large Band, Arlo Guthrie performing Alice's Restaurant for its 50th Anniversary, Bruce Cockburn, North Mississippi All-Stars, El Caribefunk, and The Hillbenders performing a bluegrass interpretation of The Who's "Tommy."